They live close to the town but are miles away from civilization, living in utter poverty and inhuman conditions. They are Chenchus, a primitive tribe, in two villages barely 45 km from this town in the heart of Telangana state. The majority of the 57 families in Chenchu Colony, a tribal hamlet of Chennapur village, survive on rats, cats, dogs, squirrels and other animals they hunt. Similar are the conditions of 24 families of Bhavusinghpally village. The fruits of development have not reached the Chenchus, a majority of whom never stepped out of their villages till this week when Telangana assembly Speaker S. Madhusudana Chary brought them to Warangal to take them around. Though this aboriginal tribe mostly lives in the forests of Telangana, Andhra Pradesh, Karnataka and Odisha, the two Chenchu villages are located in the plain area. Their ancestors are believed to have come from deep forests and settled down over a century ago. HYDERABAD: Making one-year rural service mandatory for medical students after their post-graduation is far from a settled issue. Ever since it was introduced in 2010, it has only increased the acrimony between students and medical department officials. This song and a dozen others will echo through the streets of Hyderabad and other places in Telangana as Bathukamma, a festival of young girls and married women, gets a spiffy new spin under the new Telangana government. An exhibition of photos celebrating Bathukamma, a permanent installation of flower arrangement at Shilpakala Vedika, women employees allowed to go home by 2 pm everyday till October 2 and a `10 crore grant for celebrating the festival -the government of Telangana is pulling out all stops to elevate the festival into a religio-cultural identity for the new-born state. “When I moved to this gated community 10 years back, I would be invited to various people’s houses for celebrating Bathukamma, but people felt shy of bringing it into open and observing it in a big way . Now, I think they will not think twice before celebrating Bathukamma in the open, the way it is meant to be celebrated. This change is good,“ says artist Anjani Reddy , who cannot hide her delight about the festival getting its due. “ As a child, I would go back to Nandikandi and see flowers brought home on a bullock cart, the colours, smells and the way the flowers were arranged on a huge brass plate played a key part in developing my artistic sensibility ,“ says Anjani. Others meanwhile see it as an opportunity for “cultural revival“. “I think the government sees the festival as an opportunity for a cultural revival and to impress its identity . By declaring it a state festival, there is going to be a large scale mobilisation of school and college students, women, SHGs and even working women,“ says WG Prasanna Kumar of National Green Corps. “It has always been a festival close to my heart right from the time I was a child in Nalgonda. We would get up in the morning, have a head bath and we would welcome Gowramma to our homes with an arrangement of various flowers. The tradition continues in our apartment at Attapur where we celebrate it for eight days. On a plate, we put some leaves and arrange different kinds of flowers and on the first day we offer pongali as prasadam,“ says Rangaraju Andalu, a housewife. “Every year, Bathukamma is celebrated from Mahalaya Amavasya for eight days till Mahanavami, people worship Mangalagouri. Everyday , they prepare different kinds of offerings for the Goddess and these are called saddulu. On the last day , called Saddula Bathukamma, all the nine kinds of offerings are made to the Goddess. One day before Dasara, the arranged flowers and a lamp are released into nearby water bodies by the women, all the while singing songs,“ informs Swati Gupta about the festival that coincides with Navaratri. “Flowers are the main offerings for the festival where thangedi, beera, gummadi, chamanthi and others are used to prepare Bathukamma,“ she informs. This year, women volunteers who know swimming are being trained by National Green Corps as a safety backup during the festival where women release lighted lamps into lakes. “They will manage the crowd and also keep track of the quantum of flowers being released into the lakes,“ says Prasanna Kumar. Also, there will be 25,000 Bathukammas arranged at the LB Stadium and they will be taken in a procession to the Necklace Road for releasing them on Saddalu Bathukamma at Tank Bund. But Hyderabad will see one permanent change, as the Necklace Road will be renamed Bathukamma Square, according to sources in the government. A feeling of alienation stalks people in villages under Kukkunuru, Velerupadu and Burgampad mandals, which became part of West Godavri district following the Andhra Pradesh State Reorganisation Act, 2014. Thursday’s gesture of the district administration to reach out to the ceded areas to build bridges with the people who earlier belonged to Telangana hardly helped in inculcating a sense of inclusiveness among them. The feeling of alienation among them was palpable, mainly with their very existence coming under question in the backdrop of the Indira Sagar project. Nativity issues in education and employment, lack of geographical homogeneity between the ceded areas and the rest of West Godavari district, poor connectivity and failure of the authorities in implementing welfare programmes make them alienated. “We have become nobody’s babies. We don’t have drinking water and no seed to raise cotton,” a tribal told Collector Katamneni Bhaskar at a function at Kukkunuru. All villages in the ceded mandals are facing threat of submergence, thanks to the Polavaram project. Nothing tangible has come forth from the official machinery yet for provision of alternative lands and building R&R colonies for the project victims. These merged areas are tucked away in a manner that one has to pass through the Telangana State through a stretch of nearly 50 km from Kukkunur on the Aswaraopet-Bhadrachalam road to enter the borders of West Godavari district near Jeelugumilli. Their gruelling bus journey to the ceded areas from the district headquarters has woken up the official machinery. The bus that started from the District Collectorate with 35 district level officers representing various government departments at 7.30 a.m. one day reached Kukkunuru by 11.30 a.m. It is another one hour drive to Velerupadu from Kukkunuru. Students and unemployed youth fear denial of opportunities in education and employment since they technical became non-locals with their studies elsewhere in Telangana after the merger of the villages with Andhra Pradesh. The welfare schemes such as employment generation under the Mahatma Gandhi National Rural Employment Guarantee Act and distribution of titles for forest lands under enjoyment by tribals under the Forest Rights Act failed to trickle into these remote areas due to the bifurcation hiccups. What’s Telangana Thali Without Generous Portions Of Meat! Red hot spicy meat: that’s what, most suitably, defines Telangana food. So, a typical Telangana thali then, is bound to comprise generous portions of meat, in varied forms and preparations, feel residents of the new state. Though unlike its neighbour, Andhra Pradesh, Telangana is still trying to customize an exclusive menu-card that would reflect the gastronomic interests of its people, old-timers from the region clearly have their list of kuras (curries) and pappus (daals), which they think should, almost certainly, be on that ideal T-thali.Mamsam (meat), they however reiterate, is undoubtedly the mainstay . “There are of course vegetarian accompaniments that are equally essential; the most common being the pacchi pulusu (raw, uncooked rasam, more like tamarind water with generous sprinkling of onion, coriander, chilli) and pappu. The dal can either be thick and solid, like muddapappu (tur without any tadka), or have a higher consistency of water like pappucharu (similar to sambar) or pesara pappu (which is moong dal based),“ shared Ravikanth Reddy, an entrepreneur by profession and foodie by passion. Hoping to spread the word about T-cuisine, Reddy, who originally hails from Adilabad, is now planning to take small groups of friends back to his village during winter to treat them to a classic `Telangana dawat’. Green leafy vegetable curries such as punti kura, totta charu and palakura, are also extremely unique to the Telangana cuisine, described by many as “simple yet lipsmacking“. 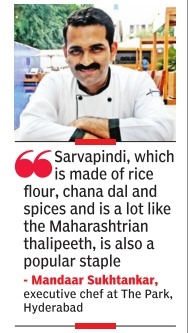 “Sarvapindi, which is made of rice flour, chana dal and spices and is a lot like the Maharashtrian thalipeeth, is also a popular staple,“ shared Mandaar Sukhtankar, executive chef at The Park, Hyderabad. Its Hyderabadi speciality restaurant, Aish, recently held a `Tastes of Telangana’ food promotion. “But it is non-vegetarian food that most people in this part of the country prefer to eat,“ said G Suraj, owner of Telangana Ruchulu -a twoyear-old eatery in the city that’s taken that first step towards designing a Telangana thali. “So there are a lot of mutton preparations including delicacies like talakaya mamsam kura (goat head curry) and kaarjum kura (liver curry) that we cook here,“ he added. These dishes, along with steaming hot plates of white rice and curd, is what customers walking into this place for a Telangana thali, are usually served. I n t e r e s t i n g l y, though meals in T households commonly consist of rice now a-days, that wasn’t the case in the past. the case in the past. Jonna rotte (jowar rotis), instead, was the staple food then, courtesy the dry weather of the region. 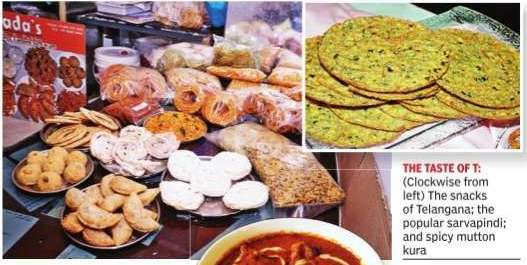 “Even now, it is integral to the Telangana cuisine though it is consumed more for breakfast than as part of a lunch dinner meal. This, together with the makka (corn) vada (often served as a side dish), assert the state’s identity as a millet-growing region,“ said developer Ashwin Rao, while sharing how country chicken (uuru kodi) is a must-have on the T-thali. While most parts of the state have fish conspicuously missing from their menu, korramatta pulusu (Murrel fish curry) is popular in certain pockets. As is kalchina mamsam (grilled meat) that, residents point out, is commonly served in Mahbubnagar. Amidst such delectable dishes, one small yet significant part of a Telangana meal is the pachchadi (pickle). Be it the mamidikaya pachchadi (mango pickle) or the nimmakaya pachchadi (lemon pickle), very few Telanganites, by their own admission, can do without a generous dollop of it. The Telangana Artist Forum (TAF) has regretted that in Andhra, Sri Venkateshwara, Yogi Vemana and Nagarjuna Universities, 85 per cent of the seats are reserved for local and 15 per cent for non-locals, while in sharp contrast, 64 per cent of seats in the Jawaharlal Nehru Architecture and Fine Arts University here, were given to students from Seemandhra. Condemning the discrimination, they have decided to take the issue to the notice of the Chief Ministers of Andhra Pradesh and Telangana and also to the Education Ministers concerned. On Thursday, they submitted a representation to the Vice-Chairman, Telangana State Council of Higher Education, Prof. Mallesh. TAF Convenor Ramana Reddy demanded that counselling in the Jawaharlal Nehru Architecture and Fine Arts University be stopped, till justice is done to students from Telangana. Since the College of Fine Arts was formed by the Nizam in 1933, over 80 per cent of the students were from Telangana and after it was merged with the Jawaharlal Nehru Technological University in 1972, regional reservations were introduced with 36 per cent for Telangana and the remaining for Seemandhra. The continuance of this age-old exploitation even after Telangana is formed is affecting the prospects of its students and is quashing their dreams of becoming artists and architects, Mr. Reddy said. NEW DELHI: Responding to alleged threats made by Telangana CM K Chandrasekhar Rao, the Indian Newspaper Society (INS) on Thursday said it would resist any efforts to intimidate or harass its member publications. “Any person with grievance against a publication has legal remedies available for redress. But acts of intimidation and threats of the kind reportedly issued by Rao have no place in a democratic society, especially when they emanate from a person holding a high position. The Society would resist with all the resources at its command any efforts to intimidate or harass member publications,” it said in a statement. INS said it has noted with “alarm” the statements about media reportedly made by Rao. Earlier, the News Broadcasters Association and the Editors Guild of India had also condemned Rao’s statement. The Telangana CM’s statement came after the Association of Telangana Multiple System Operators (cable TV operators) blocked the transmission of TV channels ABN Andhra Jyothi and TV9 since June 16, alleging that they had aired programmes “denigrating the Telangana dialect, sentiment and hurting the feelings” of the people of the state. HYDERABAD: The lapse of 66 years, multiple governments and a long-drawn Telangana movement spanning four decades notwithstanding, the contentious September 17 debate still seems to be far from over for the new state. On Wednesday, the 1948 event, when the princely state of Hyderabad officially became a part of the Union of India, sparked fresh controversy as representatives of the Bharatiya Janata Party (BJP) accused the K Chandrasekhar Rao-led government of going back on its pre-poll promise of bestowing official status on the Hyderabad Liberation Day. The “flip-flop”, BJP alleged, was rooted in the ruling Telangana Rashtra Samithi’s (TRS) attempts at appeasing the city’s Muslim population by intentionally concealing the “autocratic” image of the last Nizam. Khammam: Andhra Pradesh state on Tuesday began administration of the seven mandals in Khammam district that were transferred to it from Telangana for ease of construction of the Polavaram Irrigation Project. 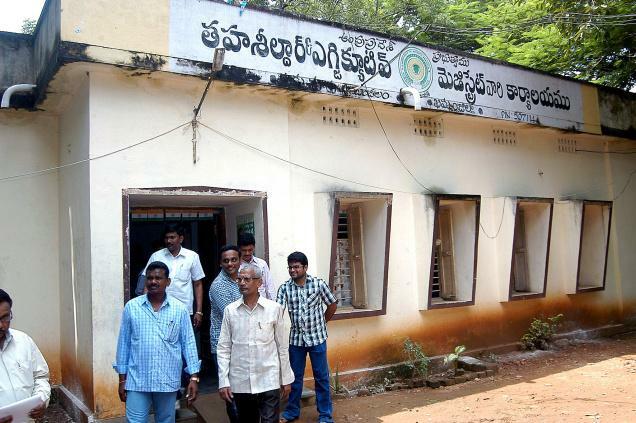 Collectors of West and East Godavari districts formally took over administration of the mandals. The mandal revenue officers have been asked to send the demand drafts received from the dealers of fair price shops to the concerned collectorates. Kunavaram, VR Puram, Chintoor and Nellipaka mandals have come under the Rampachodaravaram revenue division in East Godavari district while Veleirpad, Burgumpahad and Kukkunoor mandals under the West Godavari district. Rice and sugar, which was stocked in the godowns would be distributed to the people on behalf of the AP government. It is also decided to extend all other services like social pensions, education and revenue from the AP government. As per the details, there were 2,000 employees working in various departments in these seven mandals. Nearly 80 per cent of the employees evinced interest to work in Telangana and the remaining preferred to continue in AP. Some 463 of the 673 teachers working in these mandals would be deputed in the vacant posts in Khammam district first. The Aam Aadmi Party (AAP), Telangana, is supporting an alternative plan for Polavaram Project in a bid to avoid displacement of the tribal people in the region. The plan prepared by M. Dharma Rao, retired chief engineer of united Andhra Pradesh, was released on Saturday at a press meet organised by the party. Salient features of the alternative plan include diversion of water from Sileru river into Yeleru river through a tunnel and diversion of water from Dummugudem anicut across the Godavari river through a tunnel to meet Krishna basin requirements. One of the proposals is also to balance reservoirs on hill streams such as Sokuleru to meet the exigencies of delta and other drinking water requirements. Mr. Rao said that this plan was a win-win situation for all the sections of people in the Eastern Ghats as it would avoid submergence and consequent adverse effects. He said that this plan would ensure that nature is protected and displacement of people can be totally avoided. The party members opposed the Polavaram project in the present form and will do everything possible to stop it. “The project is in total violation of every legislature in the country. Nowhere in the world did three lakh people get displaced because of an irrigation project. The matter is in Supreme Court and we are mobilising support countrywide on this issue,” said P.L. Visweshwar Rao, spokesperson, AAP (Telangana). The party is holding a round-table meeting on September 6 at the Sundarayya Vignan Kendram and has invited political party representatives, civil society members and others to deliberate on this issue as well as on the increasing farmer suicides in the new state. The party has also released the list of about 100 farmers who had died in Telangana since the formation of the TRS government. It demanded that the government to immediately waive off farmer loans as promised and provide Rs. 20,000 to each farmer to buy quality seeds, pesticides and fertilizer.